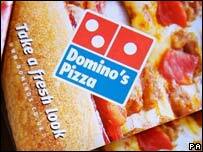 Domino's Pizza is once again facing allegations of staff abuse. A Hungarian worker at the Wolverhampton branch of the restaurant chain told the BBC that money had been illegally deducted from his pay packet. Staff at other franchises have made similar claims of abuse. This follows a dispute in August over whether Domino's in Derby had exploited its workers. The group admitted that the BBC had "certain evidence that the legislation isn't strictly adhered to". Steven Hemsley, chief executive of Domino's Pizza, declined to comment further on the specific claims, saying he had written to union officials at Unite for a full list of the complaints. But he stressed that there was no evidence of a systematic problem and claimed, "in general our franchises provide a great place to work". Payslips seen by the BBC showed that Tibor Sorosi, a former employee of Domino's in Wolverhampton, had earned negative wages because of pay deductions. He claimed that the money was taken from him by the franchise to cover the cost of buying and insuring the car he was using to deliver pizzas, which the chain said amounted to £1,700. Mr Sorosi girlfriend Szilvania Dali claimed she was not paid for her first week of work because the company designated it "unpaid training". The couple say they had no employment contracts and no tenancy agreement for the company-supplied accommodation in Wolverhampton where they lived. In the last few days, the franchisee tried to evict them from their home. Further allegations of illegal pay deductions came from a former employee at Domino's in Warrington called Tom Hackett. He alleged that his employer had deducted £100 from each of the members of staff with access to the safe following the discovery that £400 had gone missing on Christmas Eve in 2006. But he said he was refunded after making complaints. The claims follow allegations from T&G Unite officials in August that the Domino's Derby branch had sacked eight migrant Hungarian workers because they challenged deductions from their wages, which left them owing money to the company. The owner of the franchise, Surinder Kandolar, insisted that they were sacked because they had refused to comply with Home Office requirements and denied exploiting any of his staff.